One of the few perennial spring , asparagus (Asparagus officinalis, U.S. Department of Agriculture plant hardiness zones 2 through 9) is usually harvested when the spears are no taller than 8 inches. If the plants are left to grow instead, their ferny foliage can reach heights of 5 to 9 feet. These days, most expert sources, such as the University of Nebraska–Lincoln Extension, recommend that gardeners plant one-year-old male crowns, which produce more heavily than female crowns and don't self-sow. If grown properly, your plants can continue to send up spears for 15 years or more. 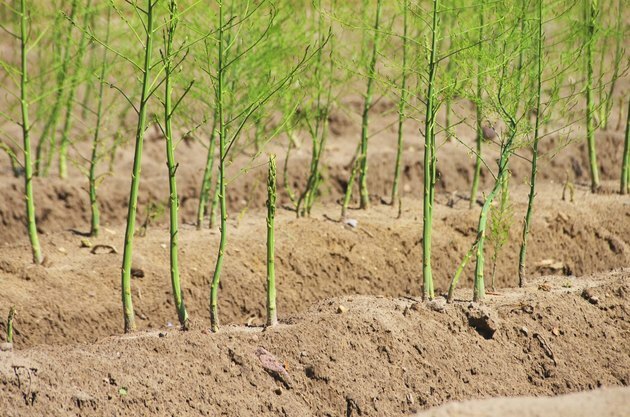 Growing most vigorously where they receive full sun all day, asparagus plants require protection from wind and a location where they won't shade other parts of the garden with their tall foliage. They thrive in light, sandy, compost-enriched and weed-free soil with a pH between 6.5 and 7.5. Asparagus crowns generally are planted in midspring in a trench 1 foot wide, 6 to 8 inches deep and long enough to accommodate all of the crowns when they are spaced 1 to 1 1/2 feet apart. The trench should be at least 5 feet distant from any other garden row. Cover crowns with only 2 inches of soil at first and water them thoroughly. Asparagus plants require at least 1 inch of water per week. During dry periods, you may need to supply that irrigation with a deep watering once a week, preferably using a dripper hose. As the stalks grow, gradually fill in the trench around them, leaving 3 to 4 inches of their tips exposed. Once the trench is full and the above-ground height of the spears has reached at least 7 inches, cover the soil around the plants with 1 inch of compost or composted manure. Top it with at least 3 inches of an organic mulch such as straw, hay, grass clippings, shredded leaves or rotted sawdust to suppress weeds and retain moisture. Don't attempt to harvest any of the asparagus spears their first spring. Instead, allow them to grow into tall, ferny plants with strong root systems. In the coldest zones, leave the frost-killed foliage in place over winter to provide protection to the crowns and cut it down in early spring. Elsewhere, you can remove it in late fall. In the plants' second spring, you can harvest spears for two to four weeks. Snap them off at soil level when they are 5 to 8 inches tall. After that time, leave any additional spears in place to provide energy to the roots and strew another 1 inch of compost on top of the decaying mulch. Renew the mulch as necessary to keep it thick enough to suppress all weeds. From the third year on, you can harvest asparagus for the entire season, which usually lasts about six weeks from mid to late spring. Leave a few of the late spears on the crowns and continue to water; fertilize with compost and mulch the plants as before.